Are you anxious about your own future? Does the uncertainty; the unknown concern you? I want to expound upon a matter that has taken me years to realize and which I will seek to encapsulate in this brief publication, potentially replacing your anxiety with peace and assurance. 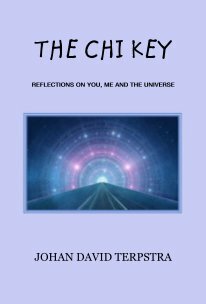 In my new book, I will give you THE CHI KEY. To get this Key, it has cost me in finances, time and effort, but this mind blowing information I give to you at a fraction of the price. This Key will unlock for you how you tick, how other people tick, how the world ticks and how the universe ticks. This is incredible stuff to know and YOU CAN KNOW IT TODAY! Before I outlay the life-changing points in the following chapters, first, let me share a summary of my extraordinary journey. I was brought up in a nominal religious home which was moral, ethical and grounded. I was raised on a farm and as a result was close to nature on a daily basis. This was my lot for the first eighteen years of my life of which the focus was FAMILY. After I left home and moved into the city, I joined a fundamental church group and became earnest about this acute belief system during the second set of eighteen years of which the focus was CHURCH. Now in the third set of eighteen years of which the focus is the ARTS, I have evolved within myself, graduating into this present belief system of which the universe has guided me with illumination into a form of ‘gnostic’ understanding. This belief system goes by a few names in history around the world but I like to call this belief system UNIVERSALISM, meaning the Universe is the central intelligent power. Chakras (meaning wheels) are seven major vortexes of energy on the mid-line of the body mirroring health and spiritual state of being. These Chakras are like multi-dimensional gateways that allow the individual to access different experiences and states of consciousness. Stress in areas of life can cause blockages of energy flow in particular chakras which leads to imbalance and dis-ease. One can clear blockages through stretching, massage, meditation, colour visualization and sound chanting. The chakras are continually under assault from life experiences, possibly triggering imbalances and blockages in energy flow. Everyone can experience stresses in different parts of the body and mind, and our individual strengths and weakness are unique to us – each main vortex deals with particular areas of function and mirrors our state of being – learning about the chakras can help us implement the best strategy to heal ourselves. The Universe utilizes __________ ... ____________ determine when one is born, when life stages begin and end; the timing of decease, and rebirth. Everything is mapped out for you at every hour of your journey – nothing is chance or a surprise to the higher self. This awareness frees the little child to fulfill its destiny and lightens up the auric rainbow cloaking the physical. This ‘gnostic’ knowledge accepted is graduation into adult-hood en route toward nirvana. UNI promotes Y.O. – You, Others. UNI has the correct viewpoint as we need first to know and love ourselves before we can reach out to others. We must begin being at home with our inner child, our higher self, balanced and in harmony and then relationships flow out from that serenity. In the realm of prayer (or expressing affirmations to the universe), one should ask for oneself first to get in balance and harmony and then relationship needs flow out from that serenity. If this was realized, then the world would be a much more live-able place. Harmony in relationships would know a new dawn and positivity could reign in a brighter tomorrow. ​UNIVERSALISM has as a basic tenet the dignity of all human beings to find their own way without coercion and mistreatment. The CHI KEY is this that our journey is governed by __________ and __________. The __________ determine the degree of force of events that come to us in life, and ________ determine the timing of these events. We all individually go through different seasons and cycles – one decade we may be focused on a theme, an interest or goal and the next decade we may ignore that past and focus on a new theme. This is perfectly natural and we should relax into this knowledge that life is a series of experiences, lessons and goals to complete.